PEOPLE IN WEATHER-affected areas have been warned to stay indoors from 4pm tomorrow for 20 hours and experts have warned that being out in the “blizzard-like” conditions could be life-threatening. A Status Red snow-ice warning will be in place in Munster and Leinster from 4pm tomorrow until 12 noon on Friday when the worst of the weather is expected to hit. 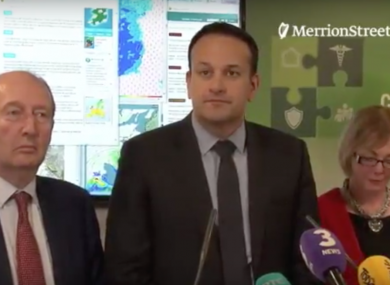 The Taoiseach Leo Varadkar warned in a public address this evening that in a blizzard scenario it could be “total wipeout” outdoors, and that between 4pm tomorrow and 12 noon on Friday the country is on “red alert”. He said that there will be “controlled disruption” by transport providers tomorrow. Ross said that public transport will be back as soon as it can after the blizzard eases. Speaking this evening, Taoiseach Leo Varadkar urged everyone to heed advice and to plan ahead for the warning. We are in a very serious situation as everybody realises. And we’re taking some fairly dramatic measures in response to that. He said that in some places power lines might come down while in others roads might be impassable. “It will take well into Friday if not the weekend for things to get back to normal. But the most important thing is that people stay safe,” he said. He added that he believes the public has taken the seriousness of the situation on board and is responding in kind. The Taoiseach said that people should only use the emergency services in a genuine emergency – but not to be afraid to do so in such a situation. During that period from 4pm tomorrow and 12 noon on Friday we are on red alert. Everyone should stay indoors and we’re asking really everyone to heed that warning and not to risk life or risk limb by going out in the snow and engaging in any daredevil activities. “Bear in mind in a blizzard scenario people might not be able to see their hand in front of their face – so it could be total whiteout in certain conditions. Alan O’Reilly from Carlow Weather has spoken to the TheJournal.ie about the importance of listening to the warnings and remaining indoors tomorrow. Wind speeds of up to 100km/h from Storm Emma are expected to clash with the snowfall from the Beast from the East tomorrow and O’Reilly warned that it will cause “zero visibility”. “It’s like a fog descending but it’s worse than a fog, it’s worse than a dense fog. It will be very hard and very disorientating to try to figure out what direction you’re heading,” he said. Within a few minutes tomorrow conditions could change from what looks like a normal snow shower to blizzard-like snow, O’Reilly warned. “The onset will be very quick and by the time someone tries to take a detour it may be too late and they may not be able to get out of the blizzard,” he said. The real risk is people who will head out tomorrow evening before the bad conditions start and they meet the blizzard. They will meet zero visibility and again the risk there is that they will stop and be stuck with snow accumulating around them. O’Reilly warned that people who are driving when the blizzard-like conditions hit will be met with zero visibility and will be forced to pull in, which could result in collisions with pedestrians. “They will get so disorientated that they will pull in. Obviously, if they’re on the road there’s a risk someone will run into them, but if they pull in off the road the snow will start to pile up around them and they may well end up trapped in their car,” he said. If you’re a pedestrian and you’re out walking and there’s zero visibility, there’s a risk somebody in a car won’t be able to see you. I would stay indoors regardless of whether you will be walking or driving tomorrow. This is the first time a Status Red weather warning has been issued since Storm Ophelia last October and it will be the first time ever that a Status Red snow-ice warning has been issued. O’Reilly stressed the importance of taking the red warning seriously. “The main thing to stress is that red warnings are very rare. While yellow weather warnings are quite common, that’s very different and the difference between yellow and orange and red is severe,” he said. This is coming from the south of the country and it’s going to impact people who are not as familiar with extreme weather as some. He added that while people are being warned to stay indoors from 4pm, they may not see the blizzard-like conditions immediately but that they should not leave their homes regardless. Email “'Unprecedented situation': Up to 40cm of snow predicted by Friday lunchtime”. Feedback on “'Unprecedented situation': Up to 40cm of snow predicted by Friday lunchtime”.